Mausoleum of Mao Zedong aka The Chairman Mao Memorial Hall is the final resting place of Mao Zedong. Mao, the Chairman of the Politburo of the Communist Party of China. 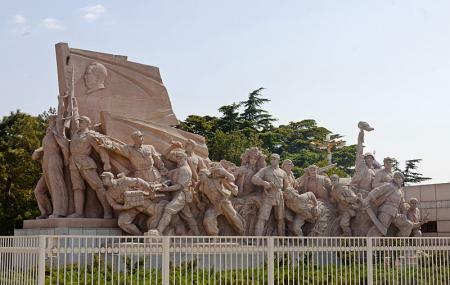 Although Mao wished to be cremated, his body was embalmed and the construction of the Mausoleum began. Visit the destination and be mesmerised by the architecture, history and the whole look of the place that is sure to make your trip a memorable one. The Museum is closed : 8:00am to 11:30am & 2:00pm to 4:00pm on Sep 9 (The day Chairman Mao passed away) and Dec 26 (The birthday of Chairman Mao). Take a bus from Tiananmen Square East. Take the subway from Tiananmen Square East. How popular is Mausoleum Of Mao Zedong? People normally club together Tiananmen Square and Forbidden City while planning their visit to Mausoleum Of Mao Zedong. Amazing and inspirational place, try and book your visit on a quiet day, one where everyone is working so there won't be a long queue. If you do manage however, try tapping the bush at the back, 2 from the very left, (including the first one) very gently and almost immediately, it will swallow you in and place you in a cool elevator. Confucius and Mao are throwing a massive party, everyday with Donald Trump as it's guest and they are playing hit songs. This beautiful place reminded me of the reason why I support communism, and it is helping me to support the cause in all ways that I can. Thank you Mao, you are my hero. This is a very important location for the People Republic of China (PRC), as it is equivalent to seeing such monuments in the US as Washington Memorial and The Lincoln Memorial. Remember that China's history surpasses that of the US by centuries. Security is very good and thorough here, once here I felt very safe and comfortable. Once you are here you are on government land, so entry and exits are maned by guards. The Monument itself is stunning to see and a must if you come to China. Definitely an experience everyone should get to feel. This is something I will take with me for ever. Salute to the great leader whom unified the modern China. A big accomplishment.